India has the world’s 2nd largest population and is the 7th largest country geographically, sharing land borders with Bangladesh, Bhutan, China, Myanmar, Nepal and Pakistan. In recent years India has seen significant advancements in its economy and the health and well-being of its people; however poverty remains widespread and India’s gross national product (GNP) is still one of the lowest in the world. Seventy five percent of the Indian population currently resides in rural areas. NACO. (2001b). Combating HIV/AIDS in India, 2000-2001. Revised, 8-12-2003. Available:http://www.naco.nic.in/indianscene/country.htm. Accessed on 10-28-2003. Available: http://www.cia.gov/nic/pubs/other_ products/ICA%20HI V-AIDS %20unclassified% 20092302POSTGERBER.htm. Accessed on 10-152003. Population Division of the Department of Economic and Social Affairs of the United Nations Secretariat. World Population Prospects: the 2002 Revision. Highlights (2003). Available: http://www.um.org/ esa/population/publications/wpp2002/wpp2002 annextables.PDF. Accessed on 11-10-2003. Srinivasan, S. (2003). HIV: The Numbers Controversy. Available: http://www.infochangeindia.org/features97print. jsp. Accessed on 10-302003. Stover, J., Stanecki, K.A., and The UNAIDS Reference Group on Models, Estimates and Projections. (2002). Estimating and projecting the size and impact of the HIV/AIDS epidemic in generalized epidemics: The UNAIDS reference group approach (2002). Available: http://www.futuresgroup.com/Documents/PAAStover02.pdf. Accessed on 11-15-2003. The World Bank Group. (1991). Project Update: South Asia Region-India. Yielding Results: Early Response to HIV/AIDS in India. Available: http://lnweb18.worldbank.org/sar/sa.nsf/Attachments/india 1 /$File/InfIlV1.pdf. Accessed on 11-012003. UNAIDS. (2002). Report on the Global HIV/AIDS Epidemic. Geneva. Available: http://www.naco.nic.in/indiascene/esthiv.htm. Accessed on 1-02-2003. UNAIDS. (2003). HIV/AIDS in Sub-Saharan Africa: Fact Sheet. Available: http://www.unaids.org/html/ pub/Publications/Fact-Sheets03/FS AIDS_ inAfrica2003_en.doc.htm. Accessed on 11-152003.
WHO. (1995). Estimated to Reported AIDS Case Ratios. Available:http://www.cdpc.com/ratio.htm. Accessed on 10-15-2003.
WHO. (2001a). 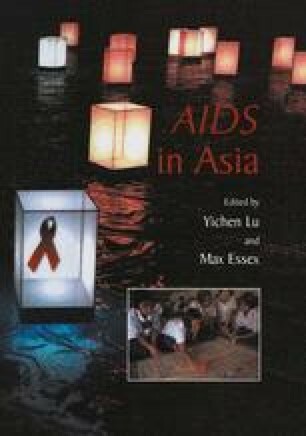 HIV/AIDS in Asia and the Pacific Region 2001. ISBN 929061 158 8. Available: http://www.who.int/hiv/strategic/ pubwpraids00/en. Accessed on 10-20-2003.